This entry was posted in Character mechanics, exercises in critical reading, Genshiken, Hobby Horses, Theory, Thought Experiments and tagged Bechdel test, for SCIENCE! 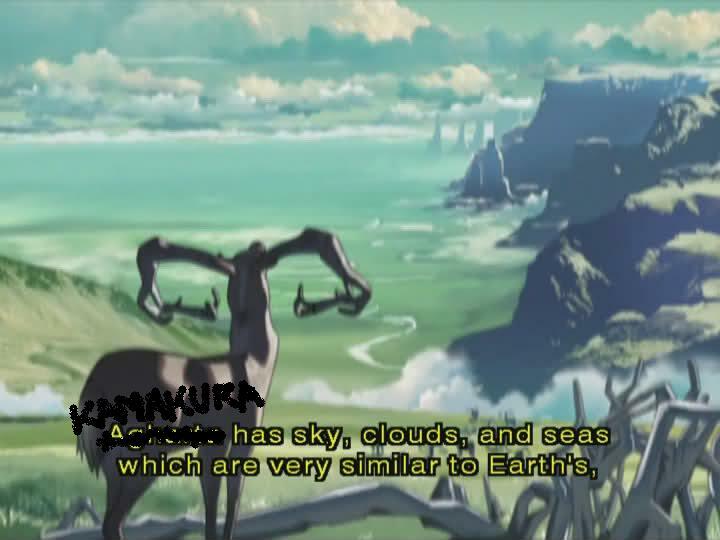 by mudakun. Bookmark the permalink. 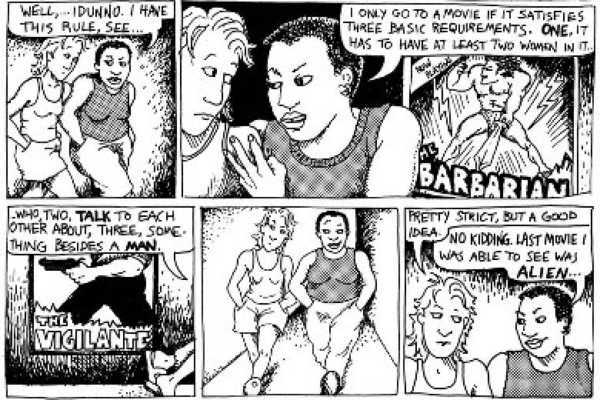 While I haven’t looked into this in as close a detail as you have, I think one thing to keep in mind is that the Bechdel test involves having at least ONE scene where the women do not talk about a man, as opposed to having an entire chapter (or film or whatever) completely devoid of conversations about men by women. 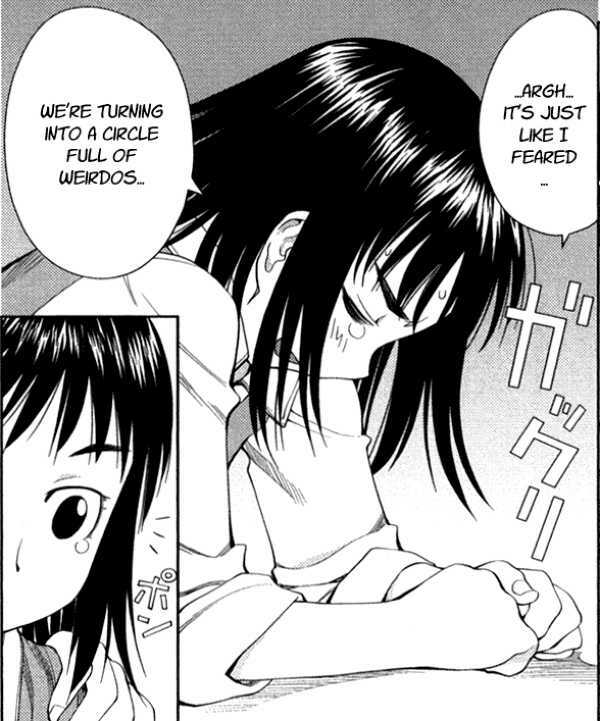 In that regard, Chapter 69 for instance would instantly pass because the very first scene is the Yoshitake sisters talking about Risa’s college woes. It’s not bad to set a more strict criteria, but I think it’s something to keep in mind that your version is a more rigorous super Bechdel test. For the Bechdel test, I just used regular criterea, no “super version”. I was going to give coach the benefit of the doubt until that pronoun slipped in.. As coach, he is an authority figure, so it is a clear fail. I even created the 1/3 weighting for “almost chapters, which is a relaxed standard, and always knew that it would be easy to argue that the Genshiken passes the FA and Lucy tests – which are supposed to be harder. 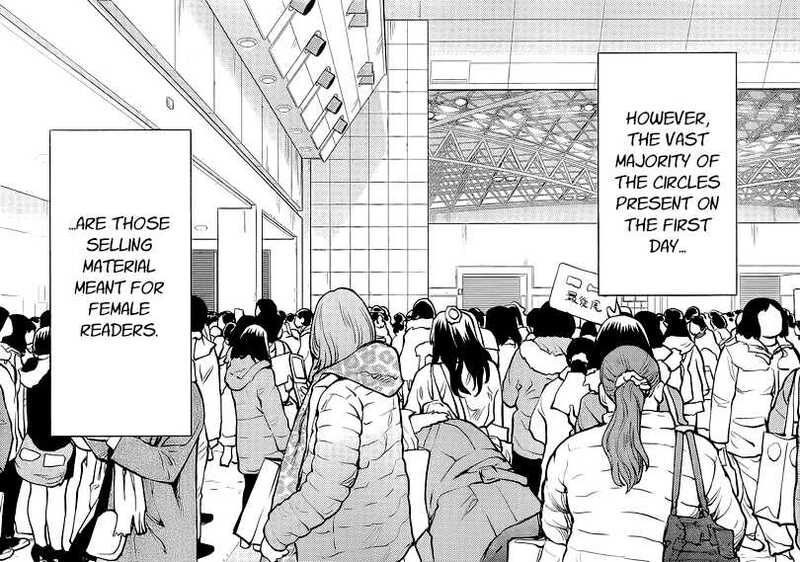 The original Genshiken passes those easily as well. I was surprised as heck at the results myself, I LIKE Genshiken and think that it is on the forefront of progressive and innovative storytelling in its field. That is why I advance a “story mechanics” explanation for the results; Kio Shimoku is trying to avoid conversational authenticity lapses, etc. 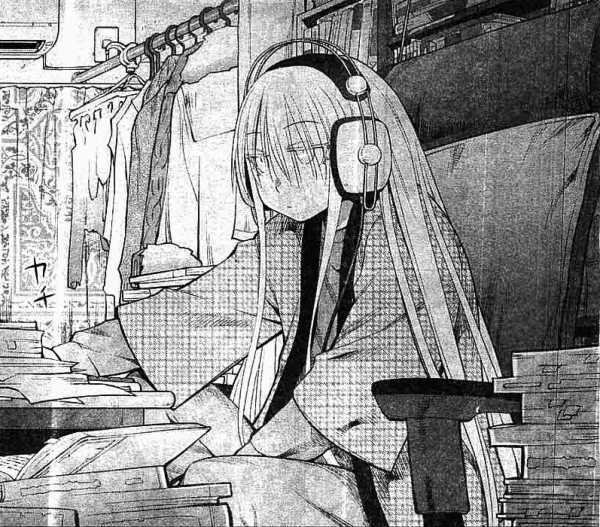 I also think that the PASS chapters are telling: I harp on the theme of a productive, supportive Genshiken, because I believe that Kio Shimoko has gone out of his way to push the idea, and (big nostalgia gasp!) it resonates with my university days memories. Thank You for dropping by and reading! Your blog was and remains a major inspiration to me and for this thing! Great new ch95 post – I can hardly wait to read the chapter! Past parody pix post aside, I think your catch on Hato’s “second stand” chapters back, was a major point and was really hoping that the scene where he speaks to her face-on in ch95 is a heroic “you are a part of me” resolution. I think your overall point that the latter tests Genshiken passes with flying colors is of course the more important element, so this was not an attempt to undermine the whole thing. Of course, I do have to say that in the original Japanese they never specify the gender of Risa’s coach (Japanese as a language is less reliant on gendered pronouns in general), so it could swing either way. I think it’s easy to assume that it’s a male coach, but there’s no hard evidence. Thank you for clearing that up. Benefit of the doubt to the original Japanese lack of coach gendering must be given! Chapter 69 is now a full PASS! (no disrespect intended to the scanlator – was their call too) So time for an addendum paragraph, as soon as I can get wordeepress to stop eating my edits, due to my painfully slowwwwwwww net connection.